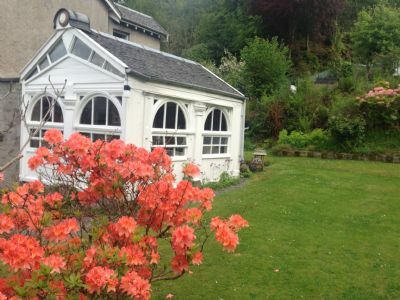 Portlea Summer House is a self catering venue for one or two people - with internet access. It is in a quiet location with a seaward frontage, yet it is 'on the doorstep' and a two minute walk from the island ferry terminal. 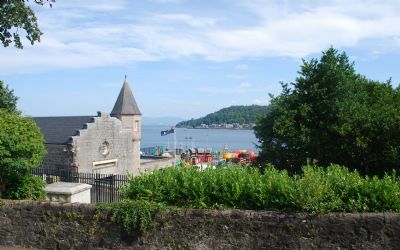 The railway terminal and centre of Oban are another few minutes walk. 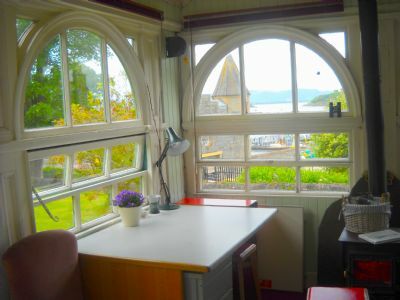 Main Room: To afford the wonderful view of Oban Bay the summerhouse is elevated from sea level and accessed by 12 steps to its own main door entrance to the rear. This room is a bright room with windows as its main feature Venetian blinds are in place to offer complete privacy when required. Two conservatory chairs and one large desk/table with two stools are included. Central heating is provided inclusive of cost per week. The double bed is 4'6. A 32" Samsung television is wall mounted. Kitchen: The kitchen is equipped with a double ring electric hob, toaster with microwave, fridge and washing machine. A belfast sink is in situ. 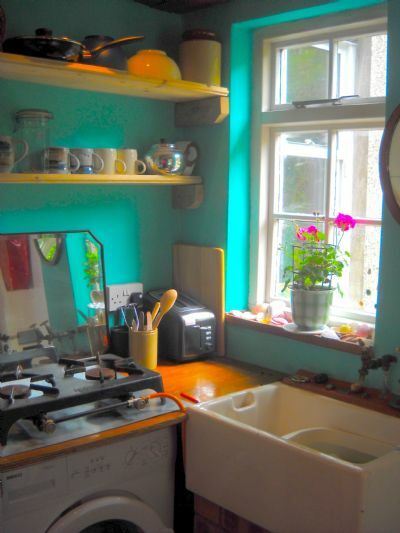 Cutlery and crockery are provided with dishtowels, clothespegs and an airer. A washing rotary drier, iron, and ironing board are not in place but can be provided on request. Wetroom This accommodates the toilet and shower and is a spacious area where views can be enjoyed overlooking Oban Bay. 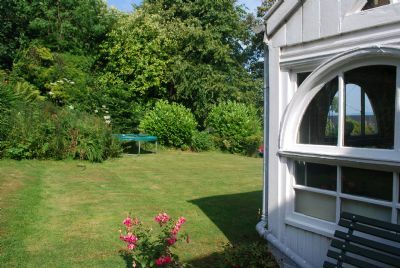 Garden Full use of the lawn alongside the summerhouse is available. A slatted Edwardian bench is provided to the rear of the summerhouse also for the sole use of the summerhouse guests where there is a slabbed patio. Extras We place an emphasis on comfort and cleanliness. The standard is closely monitored by the owner. Fresh cotton bed linen and duvet are provided with four pillows. Towels and face cloths are also provided. Parking is normally available on the road just outside and this is unregulated so without parking charges. "Hidden Extras" There are none! We want you to have a hassle free holiday so that once you pay the summerhouse rate on arrival there are no further financial interactions. 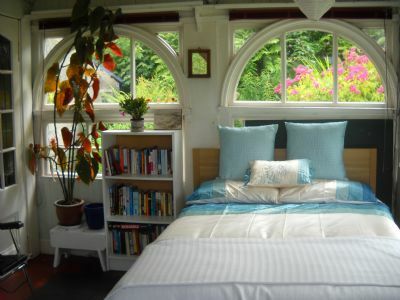 The Summerhouse has very unusual and attractive architectural features. The structure is thought to have been salvaged from a hydropathic facility that began construction in the late 19th Century but was never completed. The extensive windows overlook a large peaceful, green garden to one side, which is often visited by many birds, deer and other wildlife. Oban Bay and Dunollie Castle (seat of clan McDougall) can be seen, and also the islands of Kerrera, Lismore and the Morvern hills.